It is what is referred to as “welfare Wednesday” but the downtown Penticton streets and alleyways are eerily quiet. It is what is referred to as “Welfare Wednesday” but the downtown city streets and alleyways are eerily quiet. There’s a noticeable feeling of sadness and loss and fear among the fringe element that exists just below the surface of everyday life. Tensions outside the Soupateria are running high as two men yell at each other from across the street while others sit in silence with heads bowed. Surprising to officials on this particular day when the social assistance cheques are handed out, is that unlike just a few days earlier, the sirens of emergency first responders racing to calls of overdoses are silent. Figures from the Interior Health Authority (IHA) showed in the past 12 days there have been 25 overdose “events” compared to only one to five events each month from July to October. One of the cases on Saturday resulted in the death of a 43-year-old woman and mother. Sadly, with the exception of those who knew her, Melissa’s death at a Westminster Street motel, believed to be the result of fentanyl-laced heroin injection, will simply go down as another in the growing list of statistics of what some are calling an epidemic. “I saw her (Melissa) just 10 minutes before she went to shoot up,” said Mike, who is also a heroin user and lives in one of several backyard tents nearby. “I seen the person who was sharing with her and I said you’ve got to be f—king careful and a day later I found out she died, I just feel so sorry for her kids. Mike is streetwise and says he knows the difference if the drugs he is using are mixed with fentanyl, but keeps a lifesaving overdose drug kit containing Naloxone in his tent. The fact there were no known overdoses Wednesday appeared to be the calm before the storm. Within a three-hour period Thursday there were two calls for medical assistance, suspected to involve fentanyl. The first was for a 33-year-old woman at a Government Street house, the other was a man at a residence on Fairview Road. In both cases the victims received the antidote in time. The woman received a Naloxone injection from someone else in the residence and it’s believed paramedics treated the man. Earlier that morning Tim, a longtime heroin addict, was at the downtown Sunrise Pharmacy for his methadone treatment. He has been clean for 60 days and currently living in a detox facility. “I have used fentanyl and it’s so much stronger, when I did a shot my knees just gave way that was the green beans, the green pills that I did,” said Tim who pulled up his sleeve to show the scars of the needle tracks. “I was supposed to split it in two, but I did the whole thing. I could have died, it’s a dangerous drug. What is particularly frightening to Sunrise owner Joelle Mbamy is what she’s hearing from her clients. “One of my patients told me now people really love fentanyl, it’s no longer a threat because they really love to be high on it, now they are looking for it,” she said. On Wednesday mobile outreach worker Gwen Wain was at the Soupateria checking on her clients. She too knew the woman who died. She added that compounding the problem is the lack of affordable housing which is pushing the most vulnerable of society onto the streets. Wain, other service providers and officials are urging users to be safe, to get a Naloxone kit and also issuing a very strong warning to young people. 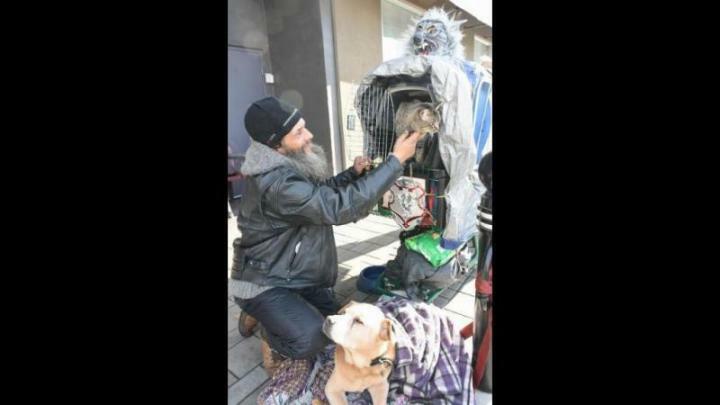 Wolf is someone else on the street trying to do what he can to help those out there with him. His world revolves around a three-block radius from a lakeside park where he pitches his tent each night to Nanaimo Square. Most days he can be found parked on a chair outside a Martin Street coffee shop. With him are the three members of his immediate family, a big yellow dog and two cats in a pet carrier inside the shopping cart with his other worldly belongings. He is one of a number of people who serve as a harm reduction worker. Along with the first aid supplies in the cart, Wolf also has kits containing clean supplies for users who ask for them. Inside the paper bags, depending on the person’s method of choice, are syringes for injecting or glass pipes with rubber tubes and screens for smoking, metal cookers or spoons for mixing and heating and vitamin C which is an acidifier used to convert insoluble drugs like brown heroin or crack cocaine into an injectable form. The vitamin C also separates the fentanyl from the prescription patches which have also found their way onto the streets and are popular among users who cut the material into squares and cook it in the water and acidifier before injecting. The kits also have tubes of sterile water for mixing, a tourniquet, alcohol swabs, Band-Aids and condoms. “I warn everybody and my standard warning is be careful where you get your party favours from because fentanyl is in everything now, hard drugs and even marijuana,” said Wolf who has been clean for 20 years. “I give them the kits if they ask for them, but they still have to find their own junk but that’s not hard. Between the casino and Nanaimo Square you can probably find two or three people who know where to get it or have it for sale. Chief Medical Health officer for the Interior Health Authority (IHA) Dr. Trevor Corneil said Thursday he was not surprised at the “spike” or cluster of overdose cases in Penticton. IHA has issued a level one alert for the region which involves communicating with the various agencies and hospital emergency wards and communicating with persons at risk through outreach workers. “We have people on the ground who are already working in the area and they have been shifting their focus over the last week to try and address this,” said Corneil. “And if we need to put more people on the ground they will let us know and we will do so.